Tallurutiup Imanga, or Lancaster Sound, is located in the northeastern region of Nunavut. It is a large natural and cultural seascape that is one of the most significant ecological areas in the world. It is critical habitat for species such as the polar bear, bowhead whale, narwhal and beluga whale. For Inuit living in the region, called both Tallurutiup Imanga and Tallurutiup Tariunga by the Inuit, it is a place rich in culture and wildlife. Tallurutiup Imanga is not yet a national marine conservation area (NMCA). The Government of Canada, the Government of Nunavut and the Qikiqtani Inuit Association recently announced an agreement on the final boundary for a future national marine conservation area (NMCA) in Tallurutiup Imanga. The combined size of the proposed NMCA in Tallurutiup Imanga/Lancaster Sound along with Sirmilik National Park, Prince Leopold Island Migratory Bird Sanctuary, and Nirjutiqavvik National Wildlife Area, will total more than 131,000 square kilometres – more than twice the size of Canada’s largest protected area (the Queen Maud Gulf Migratory Bird Sanctuary). Together, the protected areas will span from the very top of Sirmilik’s glaciers to the depths of the ocean in Tallurutiup Imanga/Lancaster Sound. Federal budget provides direction and funding for a feasibility assessment of an NMCA in Lancaster Sound. Governments of Canada and Nunavut and the Qikiqtani Inuit Association (QIA) sign a Memorandum of Understanding (MOU) to launch a feasibility assessment on a proposed NMCA in Lancaster Sound and establish a Steering Committee to oversee the project. 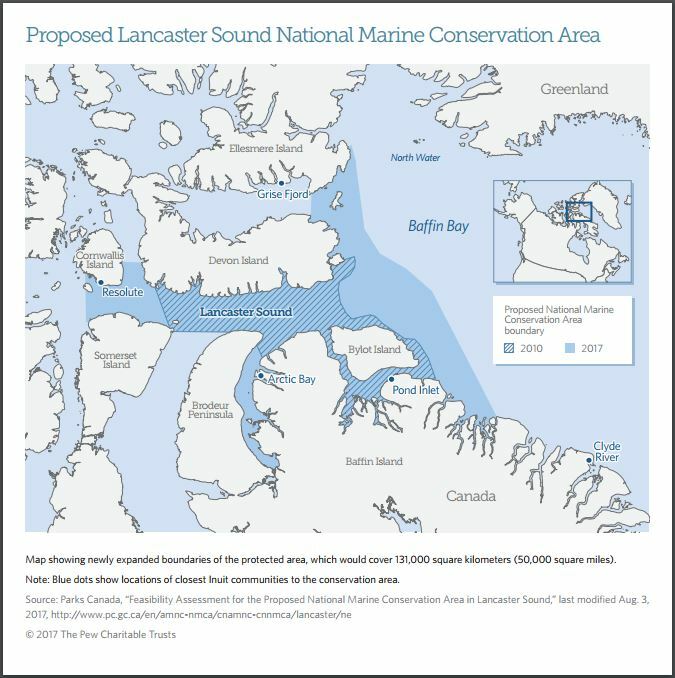 Government of Canada announces for consultation its position on a potential future boundary of 44,300 km2 for an NMCA in Lancaster Sound. The Steering Committee established under the 2009 MOU conducts community consultations, key stakeholder consultations and completes ecological and traditional knowledge studies. A resource assessment was also completed by the Geological Survey of Canada and Natural Resources Canada. Federal budget announces funding to establish, develop and operate an NMCA in Lancaster Sound. The Steering Committee submits its report and recommendations on the feasibility of an NMCA in Lancaster Sound to the ministers of Environment for Canada and Nunavut and the President of the Qikqtani Inuit Assocation (QIA). After completing an additional mineral and energy resource assessment for the area to be added to the 2010 boundary announcement, the Senior Mineral and Energy Resource Assessment Committee, chaired by Indigenous and Northern Affairs Canada found in favour of the Steering Committee’s recommended boundary. The Government of Canada, the Government of Nunavut and QIA announce the boundary for an NMCA in Tallurutiup Imanga/Lancaster Sound and launch negotiations of an Inuit Impact and Benefit Agreement (IIBA), as required by the Nunavut Land Claims Agreement. Parks Canada and QIA will negotiate an IIBA for the NMCA in Tallurutiup Imanga / Lancaster Sound. An interim management plan for the NMCA (including a preliminary zoning plan) will be prepared, with consultations, using a parallel process. Once Parks Canada and QIA sign the IIBA, the Tallurutiup Imanga National Marine Conservation Area of Canada will be established under the Canada National Marine Conservation Areas Act.